How does God feel about Gotham? I watched the new TV show on Sunday night, and it gave me an awesome reminder of God’s grace. But if you’re not familiar with the series, let me fill you in. 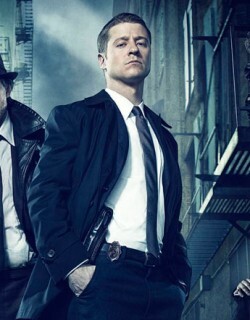 The show, named after Batman’s home city, tells the story of young Detective Jim Gordon. He’s the man who (in the Batman story) would go on to become the Dark Knight’s first ally in the Gotham City Police Department (GCPD). Later, he would become police commissioner. But this show goes where no other has gone before—to twenty years before Batman’s rise, in Gotham’s darkest days. Bruce Wayne is still a child, and the city is enslaved to its own corruption. This is where Jim Gordon starts. As one man who believes in what’s right, in a city that makes Sodom and Gomorrah look like a schoolyard. I’m only one episode in, but I already love the character for his integrity. It’s the same reason Captain America is my favourite superhero. These guys never give up. They never compromise on their beliefs. They swim against the current, even when a tidal wave’s coming. And it kinda makes me melt into a puddle of goo. But even though I love the ‘do right, fear not’ mantra of these heroes, (that motto is stolen from Ace Lightening—another great superhero!) I watched the show and Gotham itself overwhelmed me. It’s just so evil. If I was God, I’d be raining sulphur all over that sucker. It’s just too far gone. And then I remembered, we are Gotham. I am Gotham. The sin in this world, and my own heart, is darker than that terrible, terrible place. More corrupt. More treacherous. More hell-bound. It’s hard for me to comprehend. I grew up in a Christian family and have a compliant, typical oldest-child personality. I like to obey. Rules make me feel secure. How much have I really done wrong? So the show was a good reminder for me of God’s incredible grace. I look at Gotham, and wonder how Jim Gordon mustered up the courage to face the city and work toward saving it. How could he love it? Gotham’s problems were of its own creation. The place was just plain bad. But Jesus stared down an evil that was even worse. And he didn’t back down. He didn’t give up. And, even knowing that some would not respond, he fulfilled his quest to save us. He invited us to take his help. And he keeps on inviting. Thank-you God, for not giving up on us. Next time I watch that show, I’ll remember Your amazing grace. Previous PostPrevious How do I Reconcile God, Suffering and ‘Taken’?